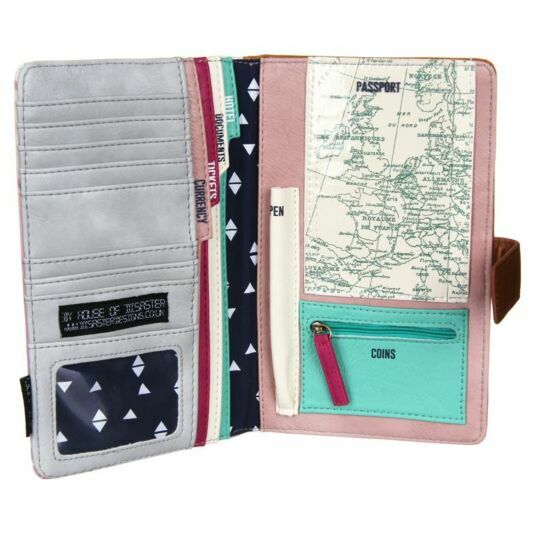 Get your travel documents organised in style with this trusty travel wallet from the Jet Lag range by Disaster Designs. If you always find yourself searching your bag for those vital documents at the airport or train terminal, then this practical travel wallet is a must-have. The wallet has a gradient effect cream-to-pink wash on the canvas-textured front cover, with a confetti pattern of scattered pink and cream simple lines. The words BON VOYAGE are printed in sans serif capital letters, with the BON in a shiny copper foil, and VOYAGE in navy blue. 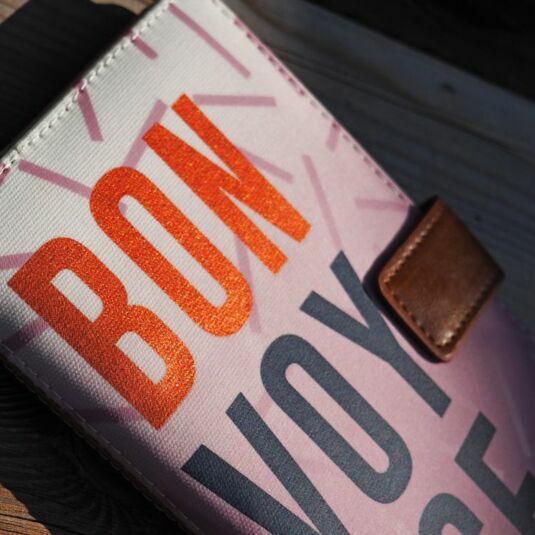 Inside, the wallet is crammed with practical detail to ensure you have a stress free and enjoyable trip. The left side is divided into five long pockets, each in a different colour for different documents. A turquoise green pocket is printed with the word HOTEL, a pale cream pocket is for DOCUMENTS, a deep pink pocket for TICKETS, and a dusky pink one for CURRENCY. In front of these there is a pale grey soft leather-look section, with eight credit card sized pockets and a clear plastic pocket for your photo card. The pockets are all made from deep blue fabric, with a leather look trim in the different colours. The photo card section and back interior is lined with navy blue fabric printed with a pattern of white triangles. 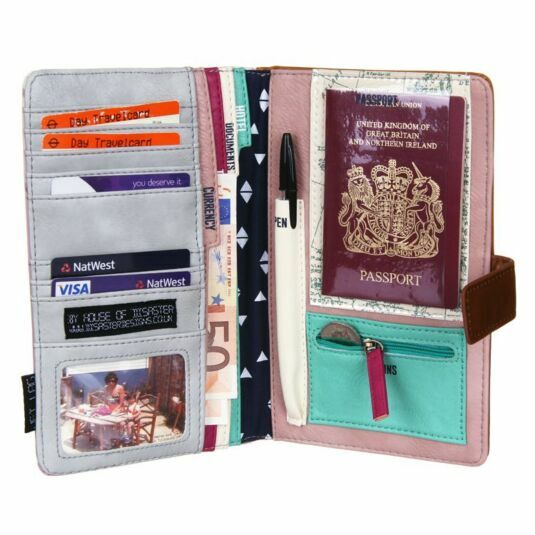 On the right side, a dusky pink faux leather pocket runs the full length of the wallet, for maps and useful paperwork. Sewn onto this pocket are three useful details, a pen holder in pale cream, a coin purse with a zip in turquoise green and a clever detail of a double pocket with a clear front for easy access to your passport. This consists of a pale cream pocket printed with a map of Britain and Europe, covered with a clear plastic pocket. The helpful words: PEN, PASSPORT and COINS are printed onto each of these. 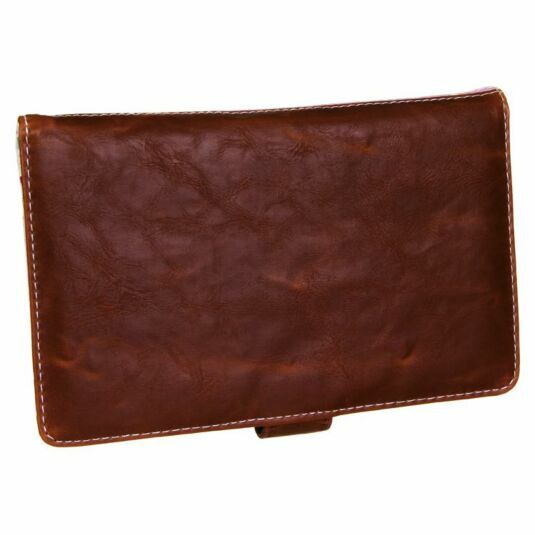 The back of the wallet is a shade of vintage brown associated with old fashioned leather suitcases, with a matching press stud clip that keeps the wallet securely closed. The wallet is made from realistic and soft faux leather, with a texture and patina that closely resemble the real thing, plus the added bonus of being cruelty free! 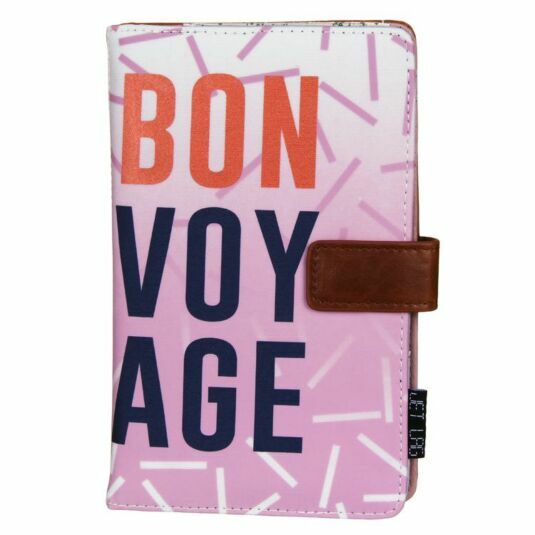 Truly stunning in design and very practical – it will be your new must-have for any future travel plans, or make a great gift for seasoned travellers of all ages, including teenagers, mothers and grandmothers. 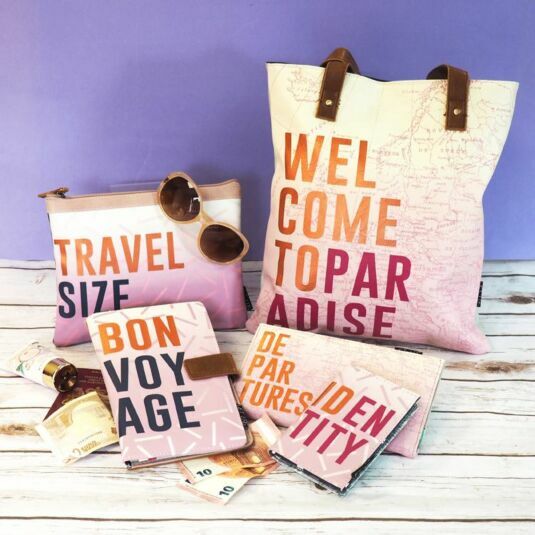 You won’t have Jet Lag with this bright and colourful, yet completely practical range from Disaster Designs which has all your travel needs covered. 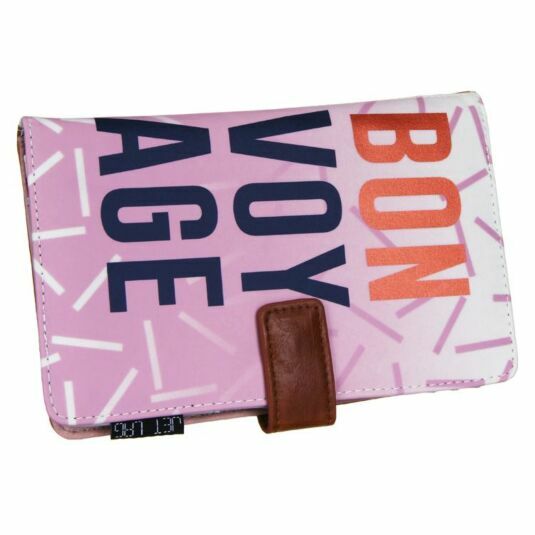 With items ranging from makeup bags and wallets to large travel bags, you can be a stylish traveller with a matching range of accessories. The palette of gorgeous colours include hot pink contrasted with dark navy blue, with gradient backgrounds and clever typography, highlighted in shiny foil. Whether you use them for a stopover or long haul, your love for this range will be more than just a holiday romance!